With over 25 years experience in the Soft Tissue and Strength and Conditioning arena , John's experience covers copius conditions and sports - paralympic tennis, sprinters and winter games, boxers both Amatuer and Professional, State and National Title Level Kickboxers and K1 fighters, Masters and Open indoor netball. John continues to developed basketballers from junior through to college level. Assisting in setting up fitness programs for various teams in various sports and been in charge of recovery programs for athletes both on a local and international level. Prehabilatation and Rehabilitation programs for specific members of teams and individuals. Prehabilation programs and screening for growth issues with young athletes. Senior Myotherapist's have over 10 years experience. Principal - Senior Myotherapist - Leanne Taylor-Leckie 18 years experience. Injuries West is more than just a workplace, it's somewhere that I look forward to coming to . As a team we all strive to encourage and support one another, which in turn helps us provide the best possible care for all of our patients. Not only are we supported on a professional level, we are also provided personal support which includes family life and members outside of work. Our team is like a big extended family, where John and Leanne are great mentors who push us to strive to be the best we can at all times. I look forward to walking through the clinic's door, as I know that I'm working amongst a great team of cheerful therapist's and seeing Narla (Clinic's Rescue Dog). It provides a working environment that's positive and committed in achieving the best possible outcome for each patient. Over the years, John and Leanne have provided constructive and supportive feedback, resulting in improved self confidence and patient welfare. I have been part of the team at Injuries West for the past four years. In that time John and Leanne have been nothing but supportive. I have been able to extend my knowledge as a therapist, and also improve on my customer service skills. John and Leanne are open to new ideas to help improve the business, and are happy to accommodate any request by staff. As part of a mentoring program, we are constantly learning to ensure that our work is nothing but the best for our patients and the community. Working with patients to achieve optimal body function is my passion! The musculoskeletal system is complex, many factors can affect overall function. There is a strong link between physical health, and mental health. At Injuries West we work as a team, we all have many individual attributes that play a important role in our team. We are constantly striving to achieve the best for our patients but also each other, helping each other progress! We always celebrate achievements at Injuires West, this is a great staple I love about the clinic, this in turn makes us set new challenges, and goals being the best we can be! I have only worked at Injuries West for a short time compared to other staff members and really enjoy it. Working for a small business allows a very interactive and positive attitude to achieve the best possible outcomes for all and thats we strive to do. We work together as a team and most importantly we have a laugh and enjoy each other's company, we are able to help one another which allows a stress free workplace. We are encouraged at all times to work pro-actively and John and Lea support us 100% in achieving our goals. The Injuries West team are also very health conscious, we are currently working on our healthy workplace achievement program and we also have many health and well being activities that we participate in both in and out of the workplace. 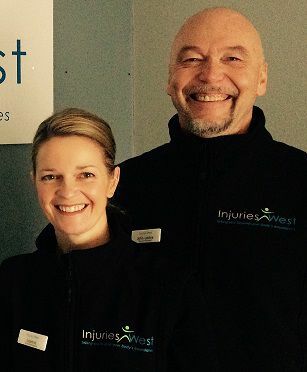 I have learnt a lot about our therapist's and what they do and feel proud to be part of the Team at Injuries West. Injuries West promotes a people first culture and this is noticed by the Welcoming Environment that you enter into. John and Leanne believe in and supporting their employees by fostering and nurturing a team based environment. I have been able to extend my knowledge base in the areas of elite sport, mental health and pain management. I have enjoyed the diversity of meeting new people and learning new things on a daily basis. I can honestly say that I work with a great team that take care and pride in their work.